It’s been seven years since Dawes emerged from Los Angeles with a sound that drew upon the legendary Laurel Canyon music scene. Now, with a fifth studio album, We’re All Gonna Die, the quartet is expanding beyond folk rock. Dawes is singer, songwriter and guitarist Taylor Goldsmith, his brother Griffin Goldsmith on drums, bassist Wylie Gelber and a new member, keyboardist Lee Pardini who replaces Tay Strathairn. We’re All Gonna Die is produced by Blake Mills, marking a reunion with Taylor Goldsmith. It was Mills and Goldsmith who started the pre-Dawes band, Simon Dawes, around 2005; after Mills' departure, Goldsmith guided the band as it morphed into Dawes. 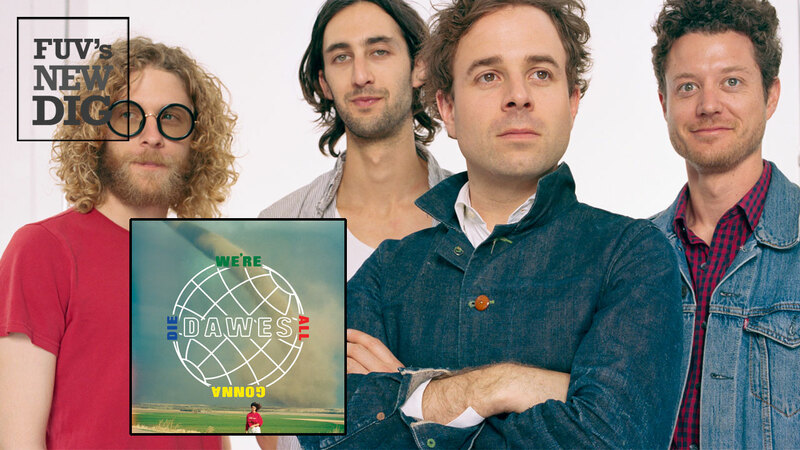 Dawes decided to stir things up significantly with this new album. The opener “One Of Us” immediately grabs you. The song sounds like a typical Dawes tune, but that familiarity lies underneath a synthesized hook and distorted vocal. Welcome to Dawes’ new world. The album’s title track, which features Jim James of My Morning Jacket, offers another side to this new sound. Taylor Goldsmith’s vocal comes up front, but the song’s slow tempo is all about the bottom end, dominated by a menacing bass and embellished by a string section. Similar emphasis on the bottom end can be heard on the cerebral “Roll Tide,” the only track on the album that Goldsmith did not have a role in writing. This ambitious sonic direction largely relies on keyboards, synthesizers, bass, and other nuances atypical of Dawes previous efforts and makes We’re All Gonna Die a vehicle for Gelber and Pardini to shine. As for Mills’ role, he is more than just the album’s producer. He becomes virtually a fifth member of the band, playing a large variety of instruments and helping on vocals on all but one of the songs. The songs on We’re All Gonna Die address a myriad of difficult situations and problems one faces in a lifetime. “Roll With The Punches” deals with the end of a relationship and “When The Tequila Runs Out” chronicles a party gone awry. The overall message throughout the album is that however bad things may seem, we all have one thing in common — death. Perhaps the everyday, mundane and petty issues we face are not worth the anxiety they create. Dawes deserves credit for altering their game plan with this new album. We’re All Gonna Die certainly provides a fresh and interesting platform for the group. There's always a risk that busy trappings could distract from the band's songcraft, one of Dawes' major strengths, but the band's new direction unveils many rewards.